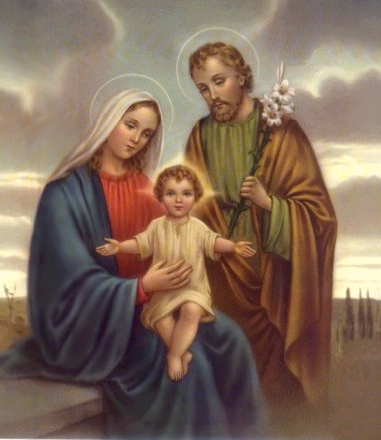 The Feast of the Holy Family is Sunday, January 8, 2012. If you start the Novena today, December 31, it will end on the Feast Day. for to Thee we have in a special way dedicated and devoted ourselves. that having revered Thee and loved Thee faithfully on earth, we may bless and praise Thee eternally in heaven. take our children under Thy special charge and enclose them in the love of Thy Sacred Heart. they are temples of the Holy Ghost, who sanctified them in Baptism and implanted in their hearts the virtues of faith, hope and charity. that they may not waver in their confidence in Thee and that they may ever remain faithful to Thy love. O Mary, Blessed Mother of Jesus, grant to our children a place in thy pure maternal heart! oh, then raise them up again, reconcile them with thy Divine Son and restore them to Sanctifying Grace. And thou, O holy foster father St. Joseph, do not abandon our children! Protect them from the assaults of the wicked enemy and deliver them from all dangers of soul and body. O dear parents of the holy Child Jesus! Intercede for us parents also, that we may bring up our children in the love and fear of God and one day attain with them the Beatific Vision. Amen. A beautiful and successful Solemn Mass for the patronal feast of St. Stephen! Thanks go out to Fr. Bede Kotlinski, OSB, Fr. Michael Donovan, O. de M., and Mr. Albert Beltz, a seminarian for the Diocese of Cleveland, as well as the St. Stephen schola for providing the wonderful music. December 26 is a special day for St. Stephen Church, and they will celebrate with a High Mass in honor of their patron at 6:30pm. For those who don't already know, you may find it very interesting that at the foot of the cross in the sanctuary at St. Stephen Church, which you can see well in the main picture at the top of the blog, is, of course, the Blessed Virgin Mary on Christ's left. 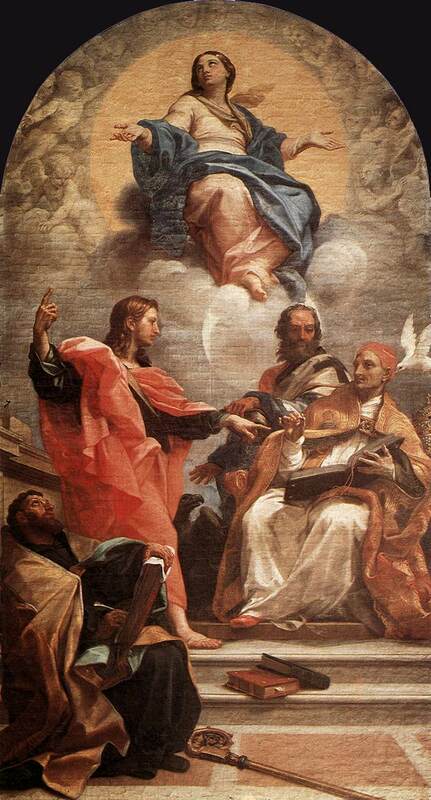 But the figure on His right, in red, is not St. John the Apostle. Can you guess who it is? Sancte Stephane, ora pro nobis! 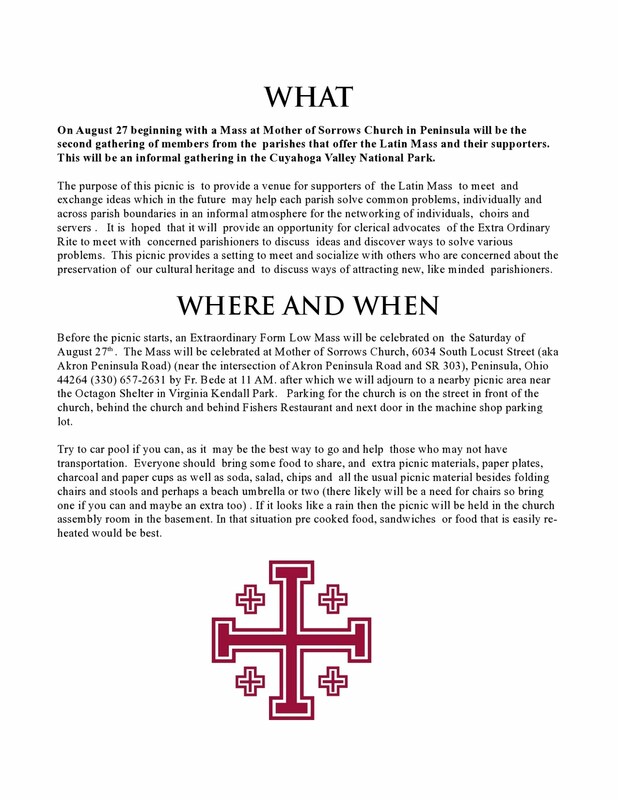 The following message was received via email letting us know about a new First Saturday devotion and Traditional Latin Mass being offered at Sacred Heart of Jesus Parish. This Mass is in the Extraordinary Form. The Mass will begin at 8:00 a.m. Individual confessions will be available beginning at 7:30. Following the Mass we will recite the Rosary and prayers to Mary. For the Feast of the Immaculate Conception, a holy day of obligation, St. Stephen's will offer a Solemn High Mass at 4:30pm. We declare, pronounce and define that the doctrine which asserts that the Blessed Virgin Mary, from the first moment of her conception, by a singular grace and privilege of almighty God, and in view of the merits of Jesus Christ, Saviour of the human race, was preserved free from every stain of original sin is a doctrine revealed by God and, for this reason, must be firmly and constantly believed by all the faithful. With these words, spoken in 1854, Pope Pius IX, in the Papal Bull ineffabilis Dei, declared Mary's Immaculate Conception to be dogma. Pius did not invent the concept. Rather, he was affirming a belief held by many Christians that came before him, from East and West, that Mary was conceived free of the stain of original sin, on account of Christ's work. God caused this immaculate conception in order to render Mary a pure vessel to bear God-made-flesh. Mary, the one who is "full of grace" and the one whom "all generations will called 'blessed'" has been viewed as unique since the earliest days of the Christian faith. Just as Christ has been called the "new Adam," the Church Fathers, especially Saints Justin (AD 150) and Irenaeus (AD 180), saw Mary as the "new Eve," who humbly obeyed God, even though Eve disobeyed. The Church Fathers also called Mary the "new ark of the covenant" and theotokos, God-bearer. It is from these titles that the doctrine of Mary's Immaculate Conception and sinlessness unfolded. Thus St. Ephrem the Syrian (d. AD 373) spoke of Mary as without stain or blemish, calling her "all-pure, all-immaculate, all-stainless, all-undefiled, all-incorrupt, all-inviolate" (see Nisibine Hymns, and "Precationes ad Deiparam"). , has suggested the East would likely accept the Catholic dogma of the Immaculate Conception if they had a Western understanding of Original Sin. The East and West nonetheless seem to be getting at the same "mystery": Mary's sinlessness and holiness in her role as theotokos. *- St. Thomas believed, like most at the time, in the entire personal sinlessness of Mary, and believed that Mary was made immaculate before her birth; His writings place this sanctification somewhere between conception and birth, at the time when her soul and body were joined, an event some medieval theologians believed occurred a short time after conception. Just a reminder that First Friday and First Saturday are this week. As usual, following the First Saturday Low Mass at St. Stephen's, Fr. Bede will offer a seminar in the St. Stephen Club Room. This month's seminar will be a continuation of where he left off last month. Also, remember Coffee and Doughnut Sunday is this week at St. Stephen's, following the 9:30am High Mass. 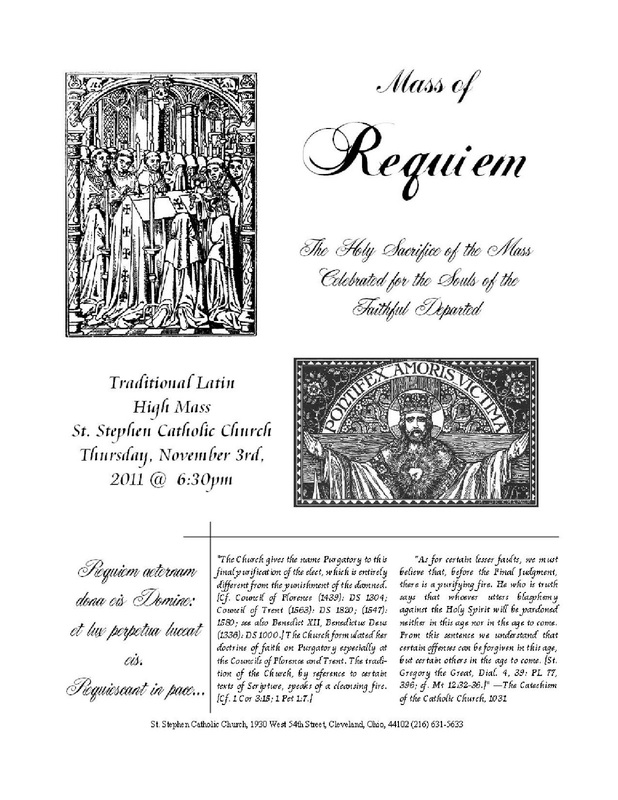 The November 3rd Requiem High Mass at St. Stephen's was beautiful. A message from Matt Lewis and Immaculate Conception, Willoughby. 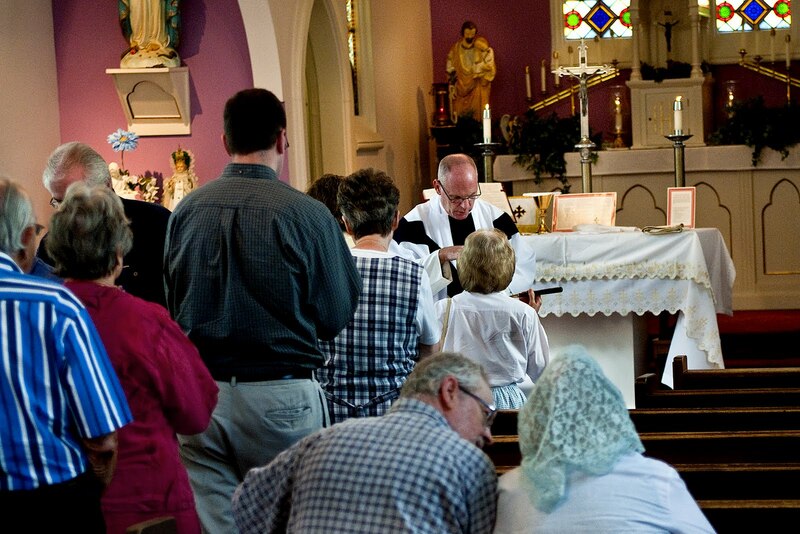 Come join us for a walk through the Traditional Latin (Tridentine) Mass, looking at the prayers, Latin responses, and liturgical movements, learn how to use a hand missal, familiarize yourself with the order of the mass, the liturgical calendar, and more! Fridays, November 18, November 25, December 2, December 9 & December 16 @ 6:15pm in the John Paul II Room in the old school building behind Immaculate Conception Church in Willoughby (enter through the middle door #3 and descend the steps). Class will be dismissed in time for the usual 7:30pm Friday night Low Mass. The topic for Fr. Bede's first Saturday seminar at St. Stephen's will be "A critique of the New Translation for the Missal." Of course, the seminar follows Low Mass at 9:30am, and will be presented in the St. Stephen Club Room. 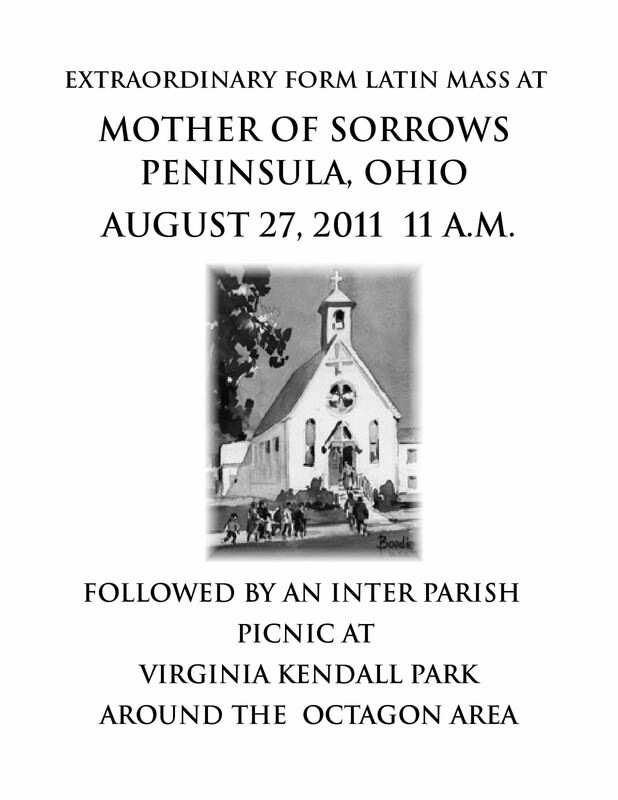 Please feel free to print out this flyer and pass it around. The following information was sent to us to post on the blog. Guest homilist: Canon Matthew Talerico from the Institute of Christ the King. On Thursday, Nov. 3, St. Stephen Church will offer a High Requiem Mass in place of the regular Thursday evening Low Mass at 6:30pm. A reminder of the Mass will be posted and sent out one week before. Please make note of this and plan to attend, and invite others as well. 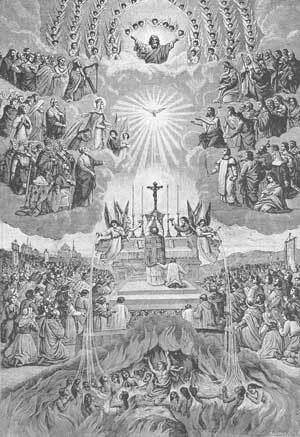 Prayers and, especially, the offering of the Holy Sacrifice of the Mass for the Faithful Departed is so important and necessary to free them from the suffering of Purgatory. Also, remember that Nov. 1, All Saints Day, is a Holy Day of Obligation. Both, All Saints Day and All Souls Day (Nov.2) fall on days when St. Stephen offers regularly scheduled Low Masses: on Nov. 1 at 7:00am and on Nov. 2 at 6:30pm. The First Saturday Seminars at St. Stephen have resumed. These seminars are given by Fr. Bede, and they follow the 9:30am First Saturday Low Mass. The seminars are located in the St. Stephen Club Room. We will send out a reminder email, along with the scheduled topic of the seminar, a week before. Enjoy these beautiful pictures from the Solemn Mass celebrated at St. Rocco Church for the feast of Our Lady of Mercy. Special thanks to Fr. Michael Donovan, O. de M., Fr. Bede Kotlinski, OSB, and Br. David Spencer, O. de M., as well as the St. Stephen schola for providing the music, and Fr. Michael Franz, pastor of St. Stephen, for loaning the gorgeous vestments. And congratulations to the members of the Mercedarian Third Order, who renewed their promises following the Mass. In celebration of the feast of Our Lady of Mercy, St. Rocco Church will offer a Solemn High Mass on Saturday, September 24, 2011, at 9:00am. This is an important feast to the Mercedarian Order. The Order of the Blessed Virgin Mary of Mercy, founded in 1218, is an international community of priests and brothers, who live a life of prayer and communal fraternity based on the Rule of Saint Augustine and the Constitutions of the Order. From this life flows the apostolic work of the Order that seeks to carry on the work of our founder, Saint Peter Nolasco, who in imitation of Jesus the Redeemer, offered even his life for those Christians in need of redemptive love. Information on the Mercedarian Order can be found here. On Saturday, September 24th, the Order of the Blessed Virgin Mary for the Redemption of Captives celebrates the Solemnity of Our Lady of Mercy. The title of "Mercy" (Ransom) for Our Lady has its origins in the Order founded by St. Peter Nolasco in 1218. Through Divine intervention and the assistance of the Virgin Mary of Mercy, the Order was founded to visit and free Christians who were being held in captivity on account of their Faith. The Order has always attributed to Mary a special participation in its foundation. For this reason the Order has always honored Mary under the title of Mercy (Ransom) with particular devotion since its beginning and in accordance with its founder, St. Peter Nolasco, who in 1249, dedicated a church in her honor. In 1600, permission was granted to celebrate on the feast of the Nativity of Mary a special liturgy dedicated under the title of "Mercy". 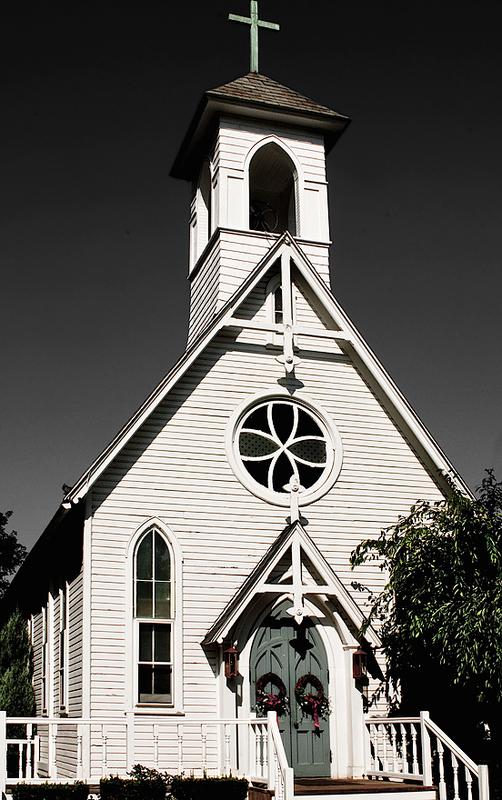 In 1696, the feast was extended to the whole Church. 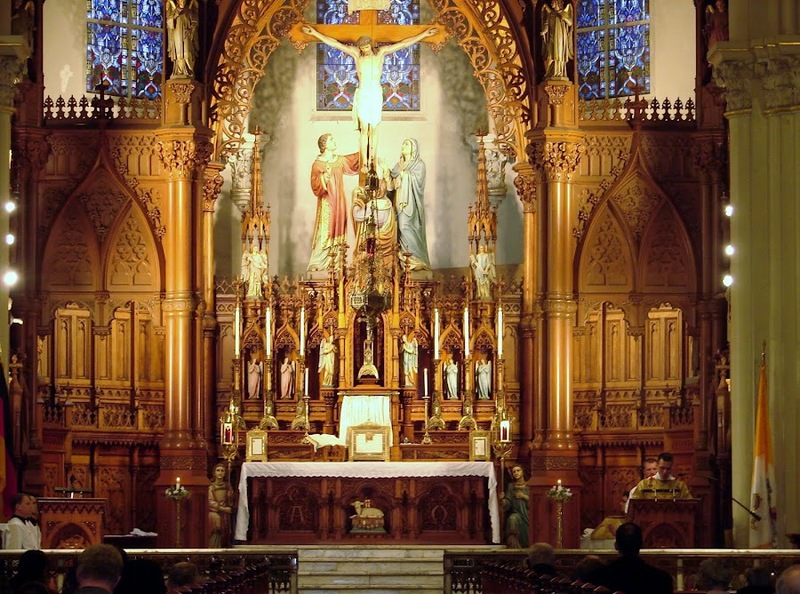 Immaculate Conception in Willoughby, Ohio, is looking for more servers for their Latin Masses. We received the following request to post. 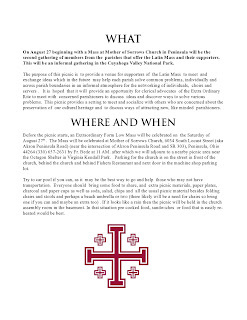 Men, do you want to learn how to serve the Traditional Latin Low Mass? Immaculate Conception in Willoughby is looking for more servers. 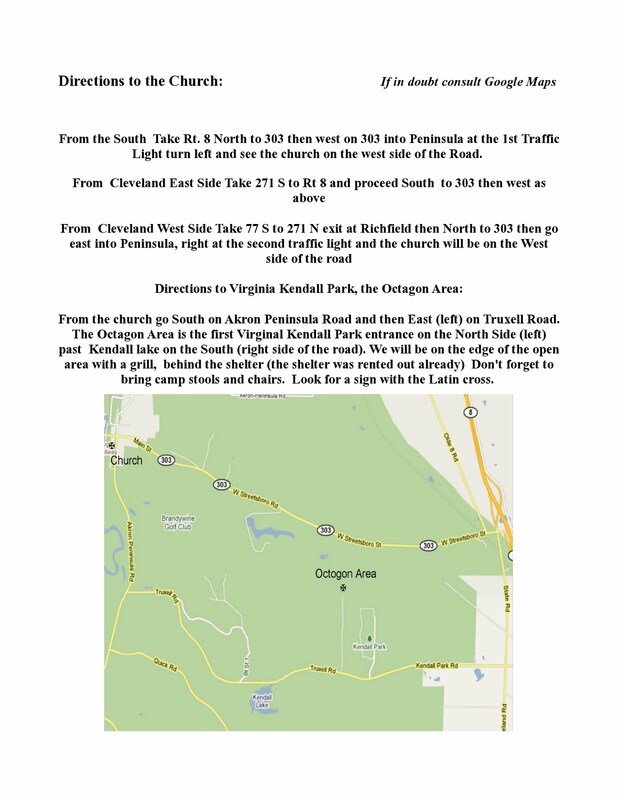 Call Matt Lewis at 440-942-2189 or email vocemur@yahoo.com if you are interested!!! Serving at the Altar of God is a privilege beyond measure. 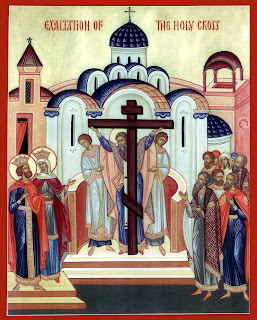 St. Stephen's will offer High Mass on the Feast of the Exaltation of the Holy Cross, Wednesday, September 14, 2011. Mass will be at 6:30pm. "Never had Satan's pride met with such humiliation as when he saw the instrument of our perdition made the instrument of our salvation. As the Church expresses it in her Preface for Passiontide: 'He that overcame mankind by a Tree, was overcome by a Tree.' Thus foiled, he vented his fury upon this saving Wood, which so bitterly reminded him both of the irresistible power of his conqueror and of the dignity of man who had been redeemed at so great a price. He would fain have annihilated the Cross; but knowing that this was beyond his power, he endeavored to profane it, and hide it from view. He therefore instigated the Jews to bury it. At the foot of Calvary, not far from the sepulchre, was a deep hole. Into this was the Cross thrown, together with those of the two thieves, the Nails, the Crown of Thorns, and the Inscription or Title written by Pilate. The hole was then filled up with rubbish and earth, and the Sanhedrin exulted in the thought of its having effaced the memory of the Nazarene, Who could not save Himself from the ignominious death of the Cross. Forty years after this, Jerusalem was destroyed by the Romans, the instruments of God's vengeance. The Holy Places were desecrated by idolaters. A small temple to Venus was erected on Calvary, and another to Jupiter over the Holy Sepulchre. By this, the pagans intended derision; whereas, they were perpetuating the knowledge of two spots of most sacred interest." A reader sent in these pictures from the August 27 Latin Mass celebrated at Mother of Sorrows parish in Peninsula, Ohio. The Solemn Mass at Our Lady of Mount Carmel on July 16 was beautiful. Thanks to all who came, especially the St. Stephen schola for providing the music. For Father Michael Donovan, O. de M., this was his first time celebrating Solemn Mass. Good job, Father! He was assisted by Fr. 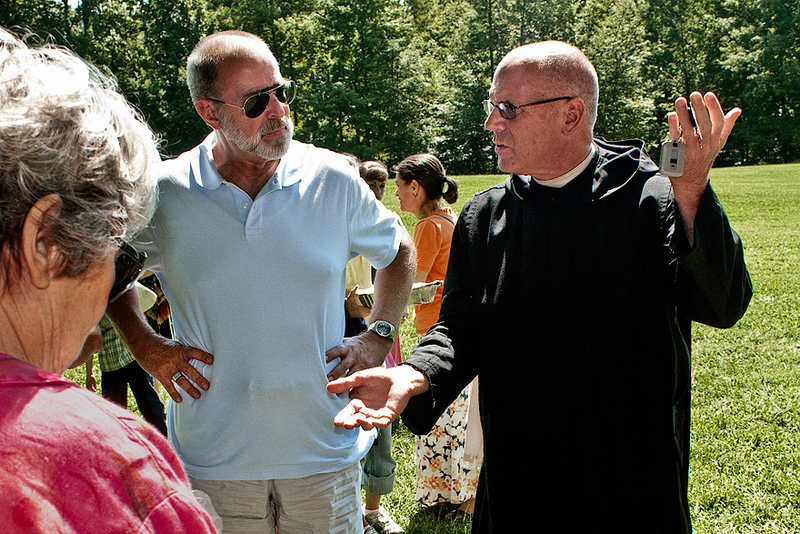 Bede Kotlinski, OSB (deacon), and Brother David Spencer, O. de M. (subdeacon). After Mass, Fr. Michael invited everyone who wished to be enrolled in the Brown Scapular to stay for the enrollment ritual. On Wednesday, July 20th, St. Stephen Church will host a visit of the Missionary Image of Our Lady of Guadalupe, and an evening of prayer for conversions, reverence for life, and the sanctity of the family. Our Pro-Life Ministry has arranged for this image, a full-size reproduction blessed at the Basilica of Our Lady of Guadalupe in Mexico, to be present during Mass and Holy Hour. This image is one of several which have journeyed on Visitation in the New Evangelization throughout the world and have visited each of the United States in over one thousand parishes. A Latin Low Mass in honor of Our Lady of Guadalupe will be celebrated at 6:30pm with our Schola Choir singing tradtional Marian hymns. Mass will be followed by a brief talk on Our Lady of Guadalupe, and then a Holy Hour with Exposition of the Blessed Sacrament. The Miraculous Missionary Image of Our Lady of Guadalupe will be available before Mass and after Holy Hour for Veneration. 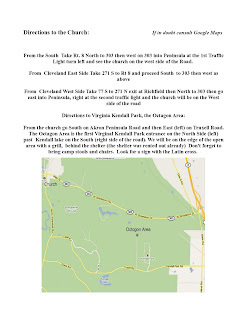 Our Lady of Mount Carmel Parish in Cleveland will host a Solemn High Mass for the Feast of Our Lady of Mount Carmel on July 16, 2011. The Mass will be at 10am. This is also the weekend that begins their parish festival. 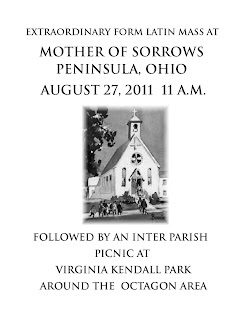 All are encouraged to attend and enjoy.